RED ALERT!!! The Australian government has revoked my visa in midflight. I was pulled off a plane in Denver and told I could not travel to Los Angeles. And then on to Melbourne Australia. I am scheduled to speak on Friday at Right to Life of Australia’s main convention in Melbourne. It is clear that the pro-abortion crowd does not want anyone to hear the truth about Planned Parenthood’s illegal actions. Please pray for me I’m stuck in Denver airport like a man without a country. Please share this video and make it go viral. Newman’s visa was cancelled after Labor MP Terri Butler wrote a letter to immigration minister Peter Dutton, citing concerns that Newman’s presence in Australia could prevent women from accessing reproductive healthcare. As many of you know I’m scheduled to speak in a national tour with Right to Life Australia from the 1st to the 10th of Oct. But the Australian government revoked my visa at the last minute. The revocation was based on a pile of lies, including the idea that I promote violence. My 25 year history of peaceful, prayerful action speaks for itself. Through a chain of events the Lord has allowed me to get on a plane in spite of many objections by the airlines and Australia. we have been in the air 11 hours and will land in about 4. Please pray that we can get past immigration so the truth can be told throughout Australia. In his statement following the High Court ruling, Mr Dutton said Mr Newman had been treated in the same manner “as any other illegal arrival”. “Any person who enters Australia without a valid visa and does not have a lawful basis to remain in Australia is expected to depart,” Mr Dutton said. I’m being held as a political prisoner in Melbourne, AU by Minister Peter Dutton. My visa was revoked as I was in the air. I was scheduled to speak on a national tour on the issue of life. I’m being held in solitary confinement indefinitely. Newman took over Operation Rescue in 2002. One of his main focuses was protesting against Dr. George Tiller, calling for the state of Kansas to prosecute him and bringing repeated unsuccessful complaints against his clinic. Tiller was assassinated in his church in May 2009 by a man named Scott Roeder, who claimed to have donated thousands of dollars to Operation Rescue. 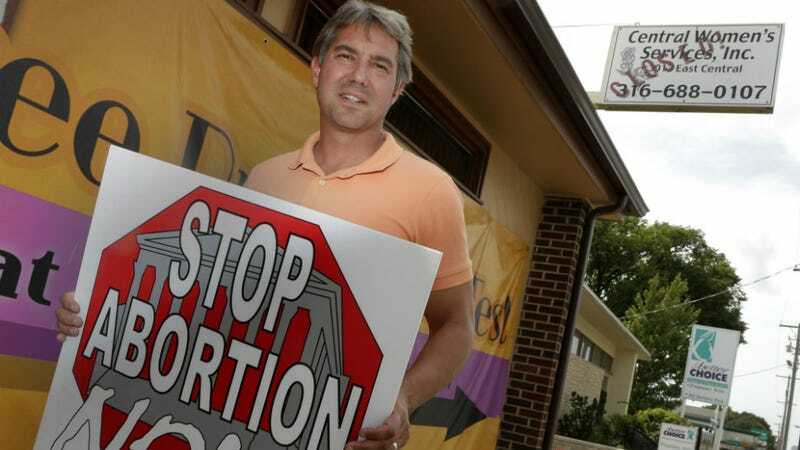 (Newman claimed that Roeder was not “a member, contributor, or volunteer with Operation Rescue.”) Newman is also currently a board member with the Center for Medical Progress, the group releasing sting videos against Planned Parenthood. Newman’s lawyers are due back in court October 30, where they will likely argue that the government had no legal right to cancel his visa. An earlier version of this post incorrectly identified Peter Dutton as Australia’s prime minister. That’s not correct. We know it’s Malcolm Turnbull, taking over for the truly vile Tony Abbott. I regret the error.